In the new version of Balanced Scorecard Designer you will find time-points feature. What does it mean? Say, you have performance values for today, but what about past and future? What about next week or next month? The new version of Balanced Scorecard designer will provide you with clear and easy to use interface to specify indicators settings and values for any date.More over the mechanism of inheritance is available, so if you want to change something you don’t need to make changes for every date, you can just change the date when the change was made and it will be applied to all indicators in future. While you move through the time, your indicators (goals) will remain the same, they are “invariant”, as well as descriptions and some other texts. But there are also some important time-depended values, such as indicator weight, current score, min and max scores. Imagine, you have indicators “Cast of the call”. Today, when you start your customer service unit, you can measure it on the scale [5..10]$ and give an important relative weight to this indicators, say, 8. But tomorrow, you may change your scale, relative weight and your score. For call center user can specify necessary measure units, such as call/hour or $/call or anything else. Once created the new measure unit can be exported or imported in other project. Learn more about Balanced Scorecard Designer. 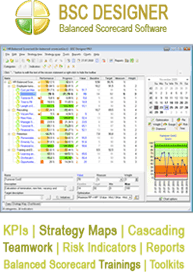 Balanced Scorecard Designer: Buy Now | Download trial version.